NORWALK, CT – June 7, 2012– Senior Living Business Interactive will be hosting an invaluable online conference to address the growing market for affordable seniors housing on Thursday, June 21, 2012. Now is the time for senior living providers and developers to explore affordable seniors housing—with services. Demographic projections confirm the expansion of this market. And the need for low- and middle-income seniors housing, where people can age in place while receiving needed support services, will become huge. This is an issue that impacts both the mission (fulfilling the need) and the bottom line (added revenue) for providers and developers. The moderator of the conference, Lisa Alecxih, Senior Vice President, The Lewin Group will pose topical questions including: How are changes in economics and expectations creating an increased need for affordable seniors housing options? How do you find affordable seniors housing with services and how does it work? Who will supply affordable seniors housing and what financing sources are available? What financing sources are available to support affordable housing for low- and middle-income seniors? Our hand-selected panel of senior living experts will address these issues and answer any pressing questions the audience chooses to submit. Our experts include: Ron Lloyd, President and Founder, RDL Architects; Nancy Spring, President, Caring Housing Ministries; and Christopher Shear, Development and Refinance Coordinator, EHDOC. The editor of Senior Living Business Interactive, Jane E. Zarem, invites you to take part in this must-see online conference. Discover new and better design options—those working now and others on the drawing board. Our panel of experts will discuss the research, the development issues, design ideas, and of course, how to finance affordable seniors housing projects and create partnerships for support services. This online conference, hosted by Senior Living Business Interactive, is expected to generate a stimulating discussion. If you’re interested in seniors housing communities, senior living financing, senior living business strategies or investing in the senior living industry, you won’t want to miss this crucial online conference, entitled “Dark Horse: The Growing Market For Affordable Seniors Housing With Services” on Thursday, June 21 at 1:00 pm ET. Senior Living Business Interactive is published by Irving Levin Associates, Inc. 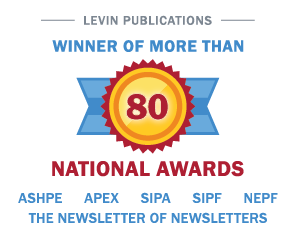 Founded in 1948, Irving Levin Associates, Inc. is the leading publisher of newsletters, reports and online data on mergers and acquisitions data in the seniors housing and health care industry. Please visit http://www.levinassociates.com/conferences/1206b-online-conference or call 1-800-248-1668 for more information about this interactive conference.